In the lecture given by one of our tour guides, we learned quite a lot about how Ireland is portrayed through advertisement, entertainment, and sports, as well as how this influences Irish identity and vice versa. One of the more important points that we learned at the beginning of the lecture was this idea that being Irish ultimately comes down to distancing oneself from any kind of modernization in order to preserve that sanctity of one’s past, culture, morals, and traditions. This nature is essentially underlined by the more well-known aspects of Irish society that most of us are familiar with. In particular, the countryside and its serenity, the richness of food and alcoholic beverages, the closeness of different communities across the island, the Gaellic games and its long-celebrated legacy, which is demonstrated culturally by the sports’ lack of monetization towards the athletes who participate in the sport. As far as advertisement, there are different ways that it portrays various parts of Irish society, whether it be everyday necessities, food and liquor, or sports. Sometimes these advertisements may give out a false impression upon people who do not know much about what Irish culture really stands for, but the major departure in all this is the idea that idea that Ireland is this country that seems to have closed itself off (to some extent, not completely) to the rest of the world, as far as modernization is concerned, thus making us question what it really means to identify as Irish. As if the amazingness of experiencing a foreign country’s diversity for the first tIme was not enough, the food made it even more amazing. With restaraunts and pubs at almost every corner you turn, it is no wonder why Ireland is praised for its richness in both food and drinks. The country’s agriculture is part of why this is the case. One of the first restaraunts we visited offered both fast-food type cuisine as well as sea-food, soups, and different types of drinks and salads to go with the main courses. The food, which consisted of a rather tall-standing hamburger kept in place with a long toothpick through the center, a mini-bucket of fries, two cups of dip dressings, and a few other sides, may have seemed like a small meal at first, but once I was halfway finished, I could hardly eat another bite, but because it was so delicious, I resiliently continued until I finished and left the dish nearly spotless. The same was the case with other foods: they are excellent in terms of both quality and quantity, which is a good fit for a price so worth it. Which is why visiting a restaurant, regardless of which one, is a must when visiting Ireland, especially Dublin. When visiting the Collins Barracks Museum, we went on a private tour through Irelands time of great economic and social transition, which came in at 1916 during the height of the First World War. We learned that in this time period, boys as young as 12 years old were being sent off to train at the barracks and sent off into battle. Economic depressions and famines accomanied were prevalent at the time. So impacting that soldiers sometimes could not affored uniforms and other essential equipment, which they had to aquire with their own money. The 1916 Rising was the major course of action led by the Irish Revolutionary army in opposition to British rule of Ireland and with the goal of gaining independence. The barracks, while still relatively intact as they were back then, now house the museum that displays different relics that give us important insight into how the 1916 Rising became such an important event in Ireland’s historical timeline. I have learned so much. I have accumulated lots of experience. I have applied everything I had best in me. I have learned about Ireland. This country is blessed. With a variety in archaeology, natural history, decorative arts and country life, Ireland is a world heritage in terms of different museums for visiting and different purposes in enriching and impacting all those that visit any of these museums. Ireland is a goldmine of information. While in this country I’ve visited more museums than I have ever visit in my entire life: National Museum of Ireland – Natural History to the Ulster Museum (in Northern Ireland which I will explain later what is has to do with my learnings). In other words, there’s something for everyone to learn from. I have enjoined so much all our trips around the Island and in the country side. These treasures I have discovered made me feel like I know more about Irish culture and I will be able to share stories’ I’ve heard with anybody at any time. I have seen the ruins of old churches, castles and documents of life in Ireland dating back to early 1100-1500. I have visiting lots of places. I had the chance to see a wide range of objects, pictures, paintings and documents relating to Ireland’s colorful heritage. There are museums dedicated to the early maritime days with that explores the glorious age of tall steam ships. I have been able to see ship models, instruments, engines and all the paraphernalia required to cross the seas. These places’ aim is to ensure the preservation of everything Irish. It was a great surprise in how well kept these artifacts has been kept. Many artists have captured the moods and views and they have exhibitions in many of the museums showcasing how they see Ireland and it was a wonderful experience to see these as well. Another place I had in attention was Famine Memorial in Dublin zone 1. The Famine Status is along the Custom house Quay and just by the river. This memorial commemorates the victims of the Great Famine of the-19th century in which 1 million died and 1 million more emigrated. The “famine” effected the island’s population significantly and is blamed on the failure of the potato crop – the staple diet of many poor Irish during 1840’s. After all, the statues of these men are not in the center of the urban area (more exactly is in the margin city zone) one step away from the rest of the agitated urban life. I have been motivated in this school trip by many factors: tour guides, museums guides, politicians advise, non-stop city life activities: constructions, renovations, remodulations of old buildings, repairs, etc. After our past two here in Ireland I have learned so much about this country and its people. I have learned about Ireland’s extensive struggle for independence and the troubles that ensued. Likewise I have viewed these struggles and the impact they had on the people of this nation through my many interactions with the local population. This has given me great insight into the complexities of civil war and the overarching international ramifications of global institutions. I will not be able to forget the lessons I have learned and the people I have met. Through our many tours I have learned extensively about the Irish’s many revolutions against the English Empire. I especially learned about one rising in particular, the 1916 Easter Rising. This extensive exposure to this event has led me to continuously make the joke “Did you know there was an Easter Rising in 1916?” During this rising members of the ICA and the Irish Volunteers took control of many government building throughout the city of Dublin. The British then began a siege of the city that killed many civilians. The Irish inevitably surrendered to the British and fourteen Irish men were executed at Kilmainham Jail. Eventually the images of these men being killed would push the Irish to a full scale war for Independence once the Great War ended. I found this rising to be especially interesting since four people killed in the struggle share either my blood or my family name. Once the Irish won their Independence in 1921 their country was still at war, this time against itself. The Irish people broke out into a civil war against each other. The Irish Civil War began when Pro-Treaty Irishmen began fighting the Anti-Treaty IRA, after Michael Collins signed a treaty with the English Government. This treaty granted the Irish people to take control of 28 of the 32 counties in Ireland. The British remained in control of the 6 counties in the North East of the Island. Once the Civil War in the South ended the Troubles in the North began. These conflicts were between those loyal to the Crown and those who wanted a United and free Ireland. These sides were predominantly split between Loyalist Protestants and Irish Catholics. This conflict has only been calmed by the lack of a boarder between Northern Ireland and the Republic, thanks to the European Union. This is also in part to the creation of a Home Rule system in the North. This has given Northern Ireland its own parliament, located at Stormont Estate. Despite the many advancements made, Northern Ireland is still resting on eggshells. This precarious position has been created by the United Kingdoms decision to leave the European Union thus creating a debate on whether a hard boarder will be created. In addition to this Stormont is not in power due to a lack of agreement between the Republican and Loyalist Parties. These conflicts have been made clear to me by the local Irish people. These political divides have become so deeply rooted in Irish culture and the Irish have no reservations of sharing their views if you simply ask their opinions. This exposure and the lessons I’ve learned will allow me to have a deeper appreciation for those on both sides of ideological conflicts. I will not forget what I have seen in this country and the people I have met. With my greater knowledge I will give greater considerations for the long term affects of decisions rather than the immediate outcomes. I will not forget my time on the island of Ireland. Our last evening in Ireland was well spent in a group dinner with (almost) everyone who lived this trip with us. For the last day we were given a free day, each of us did different things, but all of us had a wonderful time. I started my day with Jordan, Jennifer and Jami at the Queen of Tarts for brunch. I had a latte and avocado toast (which brought me a slight taste of home). Afterward, we explored the temple bar area for a short moment, and then headed back to the apartments to pack a bit. Then we ventured back out to the Temple Bar area for gelato, and to explore the weekly market before dinner. Overall, the day was very relaxed, and gave us the opportunity to reflect on our time here in Ireland. Although I’ve been abroad a few times before, this trip was unlike anything I had experienced before. Each excursion, tour, and person we met made it unforgettable. We were immersed entirely in the culture, while on tours and while alone. Each day we were given the opportunity to travel back in time and learn about some of the hardest times in Irish culture, such as the Easter Rising in 1916, and the Troubles in the later half of the century in Northern Ireland. Some of the material was unimaginably heavy, and although it was difficult to listen to at times due to the nature of the content, it was all in order to further grasp the severity of the time, and appreciate their significance today. All in all, we were given the opportunity to learn first hand, and that is something I do not think any of us will forget. One of my favorite experiences was by far watching Cypress Avenue. The play brought together the history and culture we learned and presented it in a beautifully artistic way. We were able to gauge modern day sentiments, and fears in Ireland, specifically due to the tensions that exists between cultures. Although it was an extreme depiction, and very graphic, the play did an excellent job at bringing a difficult subject to light, and portraying it in such a way that audiences, even those not well-versed in Irish culture, can appreciate. I am also very glad that our time here overlapped with the Repeal the 8th referendum – being a political science student, it was fascinating to see what the political climate was like in a foreign country, and how the population engages in it. I am quite upset that we will not be in the country to see the outcome, but I am glad that we were here long enough to experience the lead up to it. Although short-lived, I am sure that the friends I made and the experiences I had will live on for years to come. Ireland is a hidden gem in Europe, often overlooked as an island known for its green landscapes, but going on this trip has changed that conception of the island entirely for me. Looking back at my first impressions of this beautiful country seems a bit comical and naive now. This country has earned my admiration and respect for more reasons than I have words, and my appreciation goes far beyond a fanatical celebrity representation of what it means to be Irish. In fact, I don’t know that I would quantify Irish-American in the same boat as Irish at all. If I could sum up these citizens in one word, it would be the word “relentless”. What I have learned about the people of Ireland and Northern Ireland, is that their values, their culture, and identity are the lifeline of their existence. They cannot be bought or sold, or easily made to settle on peaceable terms. The 26 counties pride themselves on the Easter Uprising 1916 and the success its failure brought about. Always seeing into the future and being willing to make the sacrifices necessary to get there. Then in Belfast, we saw those who live in the country, but not in the (UK) culture to which the country belongs. Still fighting, the ghosts of the past, while trying to maintain peace for the future. Dublin, is full of diversity, and the politicians there appear to be concerned with making things better for everyone. Functioning on captions for campaigns, often self funded, and traveling abroad to learn of others doing things better, so that they could do the same. What has changed about my perspective is my awareness of the depth of the history woven through this country and everyone you meet. Whether a cab driver or tour guide, everyone has very strong opinions of what happened to make this country free, or tear it apart (depending on what side of the argument you may be on). I can clearly see a difference in my level of understanding of the political process here and the history that influenced it. Hopefully your views have been altered by the account of my adventures here too. I could not be more proud of myself, for traveling across the ocean, with a group of total strangers to learn and grow together in a culture we did not previously fully understand. I am absolutely privileged to be a part of a University and pro-active department that provides opportunities for students like me to grow, learn, and live a little more cultivated, and a lot less self absorbed. Back to America I go, but back to Ireland I shall return! During this trip, I saw many places that a person can only really see once in a lifetime, and I met many great people who taught me a lot about the history and culture of Ireland. What I learned from this trip that I felt stuck out was the way Irelands history, which stretches back thousands of years, has continued to encompass the influence of culture, folklore, mythology, philosophy, politics, and religion even today, which indicates that regardless of what part of Ireland you go to, you will almost always find some sort of reference to one of these aspects that are a part of what Ireland as a country stands for, whether it be in the numerous number of cathedrals around the urban and suburban areas, the inside of government buildings, the public areas where there is so much to see. I also learned that unlike that of American history, Ireland keeps its own history in close proximity, insofar as you learn that each historical event or time-period that has ever had any connection with Ireland (From the age of the first settlers to wander this country, to the Irish Potato Famine, to the 1916 uprising/First World War, to the Troubles, the Good Friday Agreement, to the current campaign to the repEal the 8th Amendment) are all essentially in line with each other. This is what made me want to learn more about this history (both classical and modern), because, if they are indeed connected, then each new piece of information would make sense much more easily, especially since the ones lecturing on Irelands history almost always refered back to certain events and facts for a more sensible explanation. Each one of these is connected one way or another, even the lack of monetization in sports such as Gaelic Football, along with this question of whether Ireland should follow the same patterns of modernization as its neighboring countries and the rest of the world. This alone is enough to see that Ireland is a country that strongly emphasizes cultural and religious ties. It was the eve before we leave, a reflection of our trip. Ohhh beautiful Ireland! Our time must come to an end, but you will hold a place in my heart with memories made and the urge to return, I shall be back. However, I have come to appreciate you from another standpoint, not just your beautiful views but your political and cultural differences that have plagued you within the last 105 years that are some of the most recent for a developed nation. You have taught me a significant amount and will allow me to further understand things going on here even when I leave and read upon it on the news. I have learned about Kilmainham Jail, an iconic prison that housed the Irish leaders of the 1916 Easter Rising. Many of them were executed by the British some of the most famous being Patrick Pearse, Jospeh Plunkett and Thomas Clarke. While it did hold leaders of the Irish revolutions it was also a county jail meant to hold ordinary citizens being men or women, our tour guide even told us that children were even arrested and imprisoned as young as seven years old! This jail was actually open during the Great Famine that took place in Ireland and often times individuals would commit crimes because they knew that they would be housed and fed. It is eerily similar to what we see now in our society as Americans were people who have been incarcerated most of their lives would rather go back to jail because it is something they understand and know how to survive in. Another beautiful site that I enjoyed was the Dáil, which is the house of the Irish legislature. For easy understanding they have a House of Representatives. However, the way they are elected is entirely different than our popular vote system. They have a ranking system, meaning you list 1-10 or however many individuals are on the ballot. At the end of it at all the ones are tallied, the twos and so on and so forth. Now what is interesting is that someone can have the most ones, but if there are a lot of twos and threes for the next candidate they can beat the individual who received the most ones. It is certainly interesting idea. It changes the vote. Also, many parties are represented at the Dáil unlike America where the majority is only Republican or Democrat, here in Ireland representation is proportionate to the votes given. We spoke to the Speaker of the House that day and we asked him what he felt was the most obtrusive things to politics, he said money. In Ireland, an individual running for office is only allowed 28-33k Euro. Imagine if we implemented this in the states, there would be no bought politicians but rather honest politics. Ireland, has certainly given me new thoughts and wisdom to take back home and to hopefully implement some things in our local governments. I thoroughly have enjoyed my time here and wish all my friends and professors the best in their future endeavors. Our journey through Ireland has been an unforgettable trip. I have wanted to visit this place for a long time, but I had no idea what an impact this was going to leave on me. There is so much heartache and pain woven in to their history, but the people carry themselves with such strength and kindness. I feel like I am leaving with such a different view on this island, as well as on politics. Yesterday we met Micky at Stormont and he said something that really stuck with me. He said that he considers himself a internationalist, and that he doesn’t want multicolored clothes or flags to tarnish his view on people or cultures. 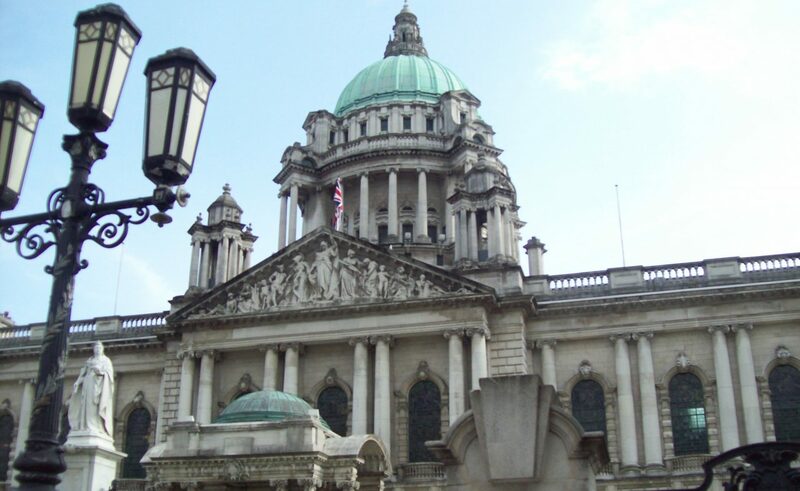 I think that it was really incredible – especially with Belfast’s history. I gained a lot of knowledge about both Northern Ireland and The Republic, but I also gained a lot of understanding. I see the pain and blood shed here, but I also see perseverance and passion and pride. I really respect the Irish and their culture on both halves of the island. The referendum we have been watching also has been incredibly eye-opening. People have been so inspired by this vote on both sides of the argument. This is an incredibly sensitive topic, but so many groups are coming together to have their voice heard. Politicians are being allowed to vote with their conscience and people are flying in from all over the world to fight for their cause. I personally have always been pro-choice, but this referendum has even had me really looking at why I align with those beliefs. The stories I have read and the demonstrations I have witnessed has relit a fire within myself, and I have a feeling this debate will stick with me for a lifetime. We had such a crazy-packed schedule, but I still wish we could’ve done more. Derry would’ve been an incredible edition to our schedule, and really would’ve put another piece together in understanding Northern Ireland’s history. I also think it would’ve been beneficial to go to the Titanic Exhibit as a group, as it really did highlight some important parts of how the city of Belfast came to be. I also would be interested in maybe studying a little bit more about the folklore that plays in to Ireland’s culture. That maybe could have been a part of the curriculum we viewed before visiting the island. I would recommend this trip to many people. I think so much can be ignored or overlooked when you just come as a tourist, but with this curriculum on top of the excursions, I truly feel like I learned something incredible. We had opportunities that are unreal, and I feel so lucky to have been a part of this experience.